Notice the catchy pun? Building a bar requires a bit more work than going to the mall, but I am certain you will enjoy it a lot more. A few things to consider are location, accommodation and budget. Location. Measure out your area to figure out the best spot for your new bar. Determining available areas to place your bar will help you decide on what accommodations you will be able to provide your future guests. Accommodations. 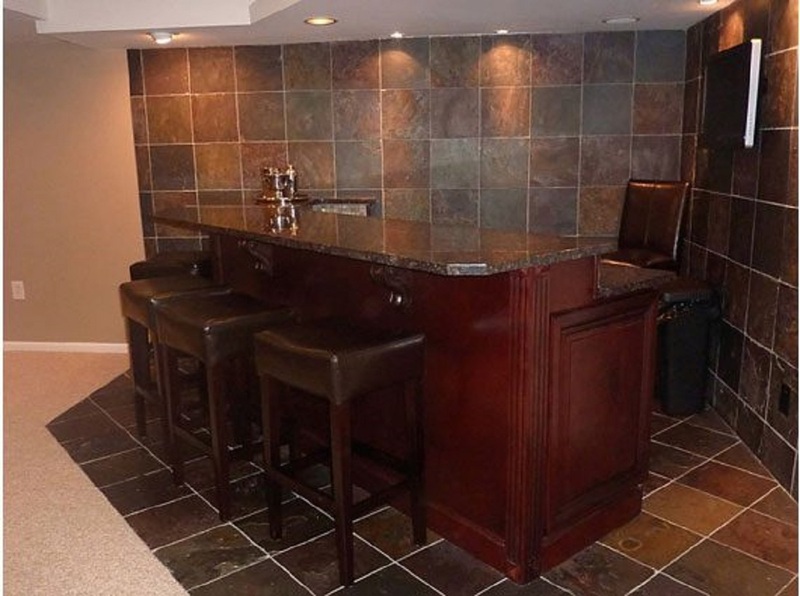 Decide if your bar consists of a place to mix drinks, or if it will also provide seating. If you plan on seating, make sure your bar stools allow enough knee room between the stool and the bar. Budget. You don’t have to have a fortune to build a bar! Consider the costs of cabinets, counter space, painting and flooring. If you decide to have a sink then you will need to consider the cost of plumbing as well. Using the picture as an example you can use RTA (ready to assemble) cabinets that set on the floor for a minimal cost. The cost of your counter is dependent on what type of slab you purchase. Typically you can find already cut slabs that will fit nicely on top of your cabinets for an affordable price. Laying tile is something you can accomplish yourself with a little practice if you are looking to save some money. Often, choosing the right color of paint presents one of the biggest challenges. Consider using your favorite cocktail as inspiration for your paint choice. Now you are ready to enjoy your White Russian (with that bear you built at the mall).